Of the many fads and three letter acronyms scattering the annals of the technology odyssey, two have emerged as key components on any CIO’s top 10 list of strategic positions, namely: big data and cybercrime. 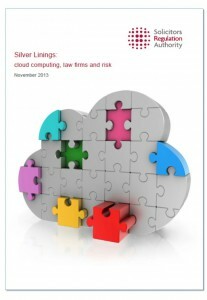 As part of its Risk Outlook, the Solicitors Regulation Authority has recently taken a close look at Cloud computing and published its guidance in a document called Silver Linings: Cloud computing, Law Firms and Risk. The Risk Outlook 2013 highlighted ‘lack of due diligence over outsourcing arrangements’ as a potential risk; citing that ‘whenever firms outsource activities, it is important that appropriate controls are in place to manage associated risks’.